The largest and most heavily forested of the New England states, Maine may not have any booming metropolises, but the public school districts of its smaller cities and towns have set an excellent academic standard, with both high school graduation rate and 8th Grade NAEP math scores being above the national averages. 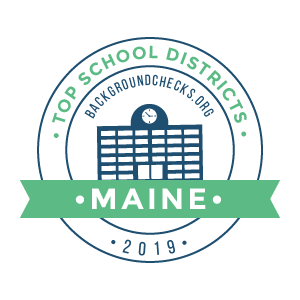 Maine’s top public school district is Regional School Unit #20, comprising two elementary schools, middle school, and a high school serving Stockton and Searsport. Searsport is a small deep seaport town with over 250 years of history. Ranking #2 is Falmouth Public Schools, administering three schools in the small coastal town of Falmouth. The district’s standardized test scores and graduation rate are well above state averages. Yarmouth Schools, operating four schools in Yarmouth, ten miles north of Portland, places third in the ranking. Yarmouth High School’s student/teacher ratio of 11.51 is above the Maine state average. #4 MSAD #51 of Cumberland and North Yarmouth is another small school district comprised of four schools. Despite its small size, the 2018 graduating class of MSAD #51’s Greely High School produced four National Merit Scholars and achieved a graduation rate of 97.7%. The #5 best public school district in Maine is Cape Elizabeth Public Schools, which like the three preceding districts in the ranking, is also based in Cumberland County and is comprised of three schools. In 2018, Cape Elizabeth High School produced 16 AP Scholars, with 89% of its graduating class going on to attend 4 year institutions. Maryland public schools took an active role in improving the state’s education system in many ways during the 2017-2018, including preparing new educators by issuing over 22,000 certifications and getting young people ready for the economy of the future with 23.2% of class of 2017 students finishing a Career Technology Education program. By examining Maryland’s best public school districts, we can see where these initiatives have had the most impact. Maryland’s best public school district is also its most expansive: Montgomery County Public Schools based in Rockville. The district’s students benefit from a well-educated, experienced group of teachers, as 86.4 of the faculty have at least a master’s degree. Baltimore County Public Schools, headquartered in Towson, ranks #2 on the list. The district holds the honor of being the state’s sole system to hold ISO 9001 international certification for management designation. #3 Prince George’s County Public Schools oversees 208 with a total enrollment of over 130,000 students. Students at PGCPS benefit from myriad special programs including the Even Start Family Literacy Program and Talented and Gifted Programs. Placing fourth is Anne Arundel County Public Schools serving 80,000 schools in its namesake county. The district ranks second in the state in quantity of National Board Certified teachers with 520. Maryland’s #5 public school district is Howard County Public Schools, headquartered in Ellicott City. The district consistently posts a graduation rate above state and national averages. Massachusetts is certainly no slouch when it comes to education, and in fact was ranked the #1 state in the nation in education by US News and World Report, particularly for the quality of its K-12 institutions. Massachusetts top public school districts aren’t just some of the best in the state, but actually rate among the best in the US, at large. The top ranking district in Massachusetts is City on a Hill Charter Public Schools, a trio of college prep high schools in Boston and New Bedford. City on a Hill schools are so excellent that though many of the students have a history of underperforming on arrival, 91% of graduates go on to attend college. Minuteman Regional Vocational Technical School District, located in Lexington, lands at #2. The district comprises a single high school that was recently awarded a National Blue Ribbon School in 2018. Placing third is Concord Public Schools and Carlisle Regional District, which comprises one preschool, three elementary schools, one middle school and one high school. In addition to excelling in academics, the district’s Concord-Carlisle High School boasts excellent sports programs, with both their boys ski and cross country teams winning state in 2019. Filling out the top five are two specialized high schools, Essex North Shore Agricultural and Technical School located in Danvers (#4), and Bay Path Regional Vocational Technical High School in Charlton (#5). ENSA focuses on hands-on science learning, while Bay Path prepares students for careers in various trades. While there is a lot of progress to be made in Michigan’s public school system, with its standing among other Midwest states dropping in the past couple decades, it’s not all bad: there are plenty of school districts in the Great Lakes State where things are going well. Let’s take a closer look at Michigan’s top five school districts. Ranking #1 among Michigan public school districts is the Copper County Intermediate School District, which administers 13 smaller school districts with a total enrollment of around 6,600 students. The Eaton Regional Education Service Agency is Michigan’s #2 public school district. Another conglomerate school district, Eaton RESA’s six component school districts are some of the best in the state in terms of composite test scores. Chippewa County’s Eastern Upper Peninsula ISD places #3 on the list. The largest geographic district in the state, Eastern Upper Peninsula ISD serves 19 individual school districts spread over three counties with an enrollment of 7,000 students. #4 Clinton County RESA serves seven public school districts with an enrollment of nearly 10,000 students, and provides additional services including the Great Start Readiness Program. The #5 public school district in Michigan is Gratiot-Isabella RESD, another large intermediate school district headquartered in Ithaca that presides over 11 local districts. Minnesota is consistently ranked one of the top states in the country based on a number of categories, with education being one of the areas in which the Land of 10,000 Lakes excels. Let’s examine Minnesota’s top five best public school districts to see how they stand out among the pack. #1 Intermediate District 287 is a consortium of 12 individual districts headquartered in Plymouth. 287 administers over 120 programs and services with over 14,000 students participating in one way or another. Placing #2 is Northeast Metro 916 Intermediate School District based in White Bear Lake. One of three intermediate school districts of its kind in Minnesota, Metro 916 serves 4,000 students spread in 14 member school districts and provides numerous programs and opportunities to those in its communities, including a career and technical center and special education services. Wayzata Public Schools of northwestern Hennepin County is Minnesota’s #3 public school district. The district presides over eight elementary schools, three middle schools and a high school, with a total enrollment of over 12,500 students. Wayzata schools excel in academics, with 9 of its schools being named Blue Ribbon schools at some point. Coming in at #4 is the Minnetonka Public School District, overseeing 6 elementary schools, 2 middle schools and a high school in Minnetonka. Minnetonka students perform excellently on standardized tests, achieving a 27.7 average ACT score. Rounding out the top five is Edina Public School District, also located in Hennepin County, comprises 9 schools and is recognized nationwide for its social justice curriculum. Despite struggling on a whole in the area of public education compared to other U.S. states, there are a number of public school districts in Mississippi that succeed in academics and in preparing graduates for higher learning. In particular, the Magnolia states top five districts are prime examples of excellent school systems. The best public school district in Mississippi is DeSoto County School District, a large district with an enrollment of 30,000 plus students. The district’s completion rate of 91.1% bests the state average by over 7 percentage points. Mississippi’s #2 public school district is Madison County School District, headquartered in Ridgeland and serving 20 schools in the Jackson Metropolitan Area. The district is largest to be awarded an “A” rating according to the statewide accountability model. Based in Brandon, Rankin County School District is #3 on the list. Presiding over 27 schools and with an enrollment topping 19,000, RCSD consistently performs above the state average in every metric, and had 300 students score higher than a 28 on the ACT in 2018. #4 Oxford School District comprises eight schools serving over 4,000 students and boasts one of the highest graduation rates in the state. Oxford was recently named a District of Innovation by the Mississippi State Board of Education. The Petal School District, comprising three elementary schools, a middle school, and a high school, is Mississippi’s fifth best school district. Petal High School was named a National Blue Ribbon School in 2007 for its excellent performance. Overall, Missouri public schools’ performance isn’t too shabby, with 8th Grade NAEP math scores meeting the national average and the 87.8% high school graduation rate besting the national average by over 4 percentage points. Interestingly, all of the state’s top five public school districts are located in St. Louis county. Missouri’s top public school district is the School District of Clayton, with five schools serving Clayton, as well as a part of the city of St. Louis. Clayton is frequently considered one of the best school districts in the nation, with a 99.5% graduation rate and a ACT composite score of 25.9. Placing second is the Town & Country-based Special School District of St. Louis County, which administers 8 schools. SSD is one of the top districts in the nation in providing students with special needs a beneficial education and career path. #3 Rockwood School District is the state’s largest school system, spreading out 150 square miles with an enrollment of over 21,000 students. A whopping 10 schools in the district have been named National Blue Ribbon Schools. Landing at #4 is Kirkwood School District, which comprises 9 schools in the Kirkwood area. Kirkwood High School is one of the best high schools in the state, with a graduation rate of over 99% and produces National Merit finalists annually. Ladue School District is Missouri’s #5 public school district. The district does great in preparing students for higher learning with 91% of 2018 grads going on to attend college. Picturesque Montana is one of the most beautiful states in the nation, as well as one of the least densely populated, affording students plenty of room to roam after the last bell rings. Incidentally, Montana is no slouch in education, either. Let’s have a closer look at Big Sky Country’s top five public school districts. Montana’s top public school district is Bozeman Public Schools, administering 12 schools with a total enrollment of over 2,000 students in the city of Bozeman. Bozeman High School is widely considered one of the finest highest schools in the county, with Newsweek naming it among the top 3% of US high schools. #2 Whitefish School District is composed of 4 schools in Whitefish, which labels itself “Montana’s outdoor recreation playground”. In addition to excelling in academics, athletes of Whitefish schools have brought home numerous state championships over the years. Placing third is Big Sky School District based in Gallatin County. Since opening in 2009, the district’s Lone Peak High School has distinguished itself academically, recently being named an IB World School. Sidney Public Schools, a modestly sized district of four schools, is Montana’s #4 public school district. Completing the top five is Corvallis School District #1, a three school district near the western border of Montana. Students at Corvallis High School enjoy a 15.14 student/teacher ratio.